At midnight on January 24, 1954, the last step was taken in the armistice to end the war in Korea. That night, the neutral Indian guards who had overseen the prisoner of war repatriation process abandoned their posts, leaving their charges to make their own decisions. The vast majority of men allowed to choose a new nation were Chinese and North Koreans who elected the path of freedom. There were smaller groups hoping that the communist bloc would give them a better life; among these men were 21 American soldiers and prisoners of war. We Fight for Peace tells their story. During the four months prior to the armistice, news had spread throughout the United States and the world that a group of 23 Americans was refusing repatriation. In the interim, two of the 23 soldiers had escaped. Once back behind American lines, the first voluntary repatriate, Edward Dickenson, was given celebrity treatment with the hope that this positive experience would entice the others to return to the United States. Just one more American POW, Claude Batchelor, chose repatriation. In the United States, Dickenson, who was being treated at Walter Reed Medical Center, was placed under arrest and charged with a variety of collaboration related crimes. Weeks later, Batchelor was similarly arrested. Over the course of the coming months, Dickenson and Batchelor, against the backdrop of Joseph McCarthy's Army Hearings, were prosecuted, convicted, and imprisoned. In the ensuing years, Dickenson and Batchelor, both of whom had voluntarily returned to the United States, watched from their jail cells as most of the remaining 21 Americans trickled back home, protected by the dishonorable discharges they received. 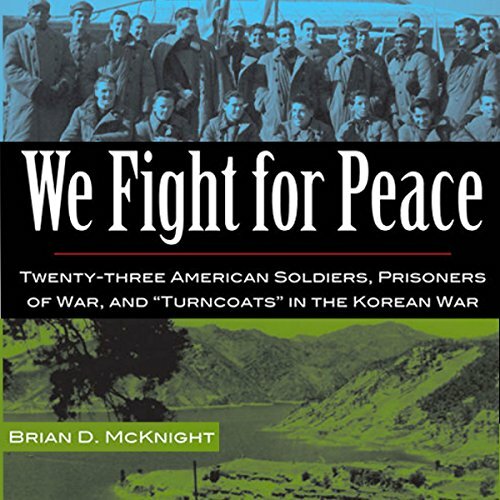 We Fight for Peace is the first comprehensive scholarly work on this controversial event in international history.